On the “Manage Menu Items” screen, click the “Add Menu Item” button. This will bring up the following screen to create the new menu item. The settings are explained below. Adds a homepage menu item. Adds a customer account page menu item. Adds a customer account page menu item, with “log out” drop down box when a logged in customer hovers over the menu item. Adds a checkout page menu item which is always visible in navigation bar, regardless of whether a customer has added anything to their cart. Adds a checkout page menu item, which is only visible in navigation bar when customer has added an item to their cart. Adds a login page menu item. If a customer is already logged in, this will change to “Logout”. Adds a contact page menu item. Adds a CMS page in your store as a menu item, with optional use of parent headings for a fold out menu for subcategory pages. Adds all default product categories (standard Magento category tree) as menu items, with a dropdown box to display subcategories. This is the standard Magento navigation menu – the difference is that you can slot the categories in between other menu items. Adds all product categories in your store under a user-friendly parent heading of your choice (eg. “Shop” or “Browse”). Individual product categories will display as a drop down/fold out menu . Adds a shopping cart menu item, with a drop down mini cart when a customer hovers over the menu item. Adds an individual product category menu item/s (multiple product categories can be displayed as separate menu items). Adds an individual product menu item/s (multiple products can be displayed as separate menu items). Adds the main page of your store's Aheadworks blog (if installed) as a menu item. 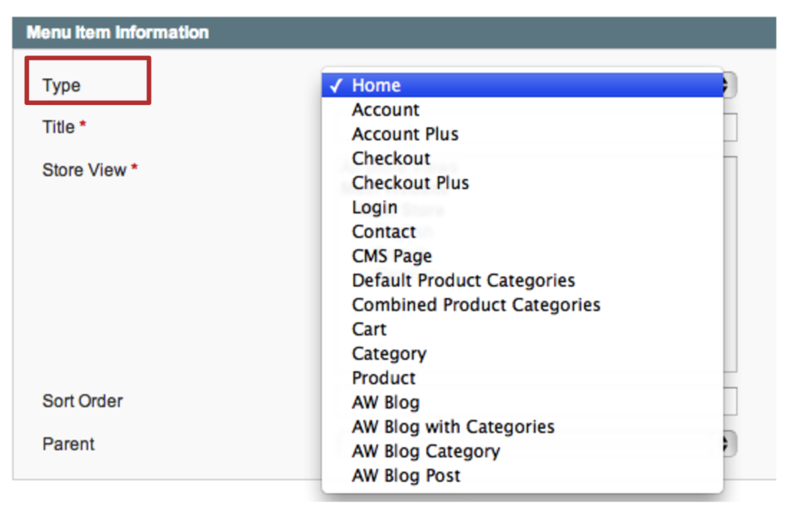 Adds the main page of your store's Aheadworks blog as a menu item, with a drop down menu with all blog categories. Adds a category of your store's Aheadworks blog as a menu item (multiple categories can be displayed as separate menu items). Adds an individual blog post of your store's Aheadworks blog as a menu item (multiple posts can be displayed as separate menu items).